Discover unique water, land, air and family adventures that will give your next Fiji holiday an extra dash of excitement. As tempting as it might be to make every day a resort day, you'll add lasting memories to your holiday by exploring more of what Fiji has to offer. There are adventures for all ages and levels of daring, from peaceful and fascinating to pure adrenalin fixes. You can trek over mountains, raft down rivers, zip line through forests, get close to local wildlife, snorkel or dive marine reserves. You can even see it all from above on a tandem skydive. Ride through pine forests to ocean views, visit remote villages and schools, connect with a sightseeing helicopter tour, visit local markets and go sea kayaking around a sand cay – these are just some of Fiji's best adventures. Surrounded by sparkling ocean and blessed with rivers running from the highlands to the sea, Fiji is a perfect playground for adventure-loving water babies of all ages and levels of experience. To snorkel with reef sharks and giant manta rays, head to the Yasawa Islands. High-speed catamaran day trips and transfers depart from Denarau Marina. Reef sharks like warm shallow water, making this Fiji snorkelling adventure easy for people of all abilities. Manta rays visit the area from May to October and they're known for entertaining snorkellers with aquatic manoeuvres and close passes. To see bigger sharks in deeper water, head to Beqa Lagoon, part of a shark marine reserve and conservation project that offers world-famous dive trips from Pacific Harbour and Kadavu. If you're not a trained scuba diver, the warm waters of Fiji are the ideal place to get your dive qualifications and unlock the wonders of the underwater world. Fiji's surf breaks offer exciting waves for all levels of experience. Most surfers head to the Mamanuca Islands for legendary breaks like 'Swimming Pools' for beginners, 'Desperations' and 'Namotu Left' for intermediates or 'Restaurants' and 'Cloud Break' for advanced surfers. On the main island of Viti Levu, you can find great beginner waves at Natadola Beach on the Coral Coast. Fiji's highland gorges, rivers, estuaries and lagoons provide are an adventure playground for white water rafting and kayaking. Explore rainforests, waterfalls, mangrove ecosystems and beaches with as much adrenalin or laid-back tranquillity as you choose. Simply put yourself in the safe hands of experienced local guides from companies like Rivers Fiji. For high-speed adventure in paradise, book a trip with Sigatoka River Safari. This famous jet boat tour offers a scenic adventure 17km up the Sigatoka Valley with knowledgeable local guides. A highlight is the stop at a village, to meet the local people, experience traditional customs and enjoy an authentic rural Fijian lunch. Many resorts can arrange all kinds of water sports for you to enjoy, it's just a matter of letting them know what you'd like to try. 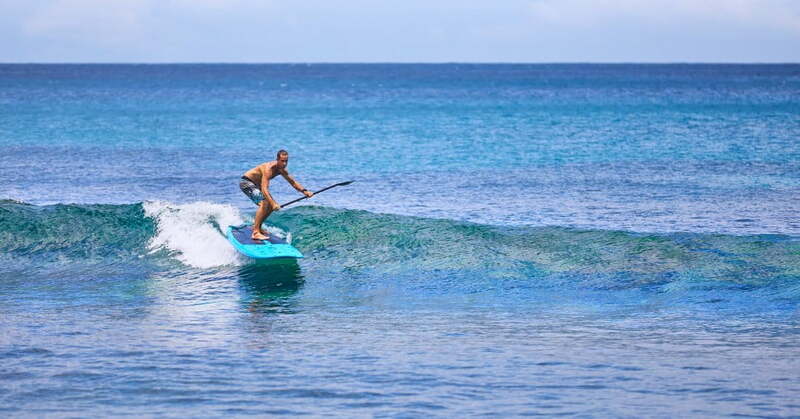 Stand up paddle boards, cruising and sailing, surfing, windsurfing, jetski safaris and jet-powered fly boarding are all on the Fiji adventure menu. Escape the ocean for a while to discover another side of Fiji with land-based tours and activities that explore the spectacular mountains, rainforests, villages and fertile back country. Experienced off-road adventure operators like Go Dirty Tours of Nadi offer a great selection of popular quad bike tours. You can ride through pine forests to ocean views, visit remote villages and schools, connect with a sightseeing helicopter tour, visit local markets, relax in mud pools and hot springs, discover waterfalls or go hard out on winding off-road tracks and river crossings. Based at Pacific Harbour, Terratrek Tours offer self-drive off-road tours in 4WD all-terrain vehicles (modern dune buggies). They're a fun way to get deep into the rainforest, find remote walks to waterfalls, river swim, capture amazing photos of long range views and smile your face off while blasting along rural tracks. From Sigatoka, you can climb aboard an open air 4WD mini-coach and your knowledgeable guide will take you on 'the road less travelled' to explore Naihehe Cave, Fiji's largest cave system. You'll stop to meet locals, cross the Sigatoka River on a punt, learn about the cave's history of cannibalism, formally meet a high priest guardian of the cave and explore 170m into the impressive underground system. There's no better way to get close to wild Fiji than exploring the national parks, coastal walkways and mountain trails on foot. On Viti Levu, Talanoa Treks offer guided trips ranging from single day walks to multi-day hikes across the island summit overnighting at remote villages along the way. On the garden island of Taveuni you can hike through tropical forest in the Bouma National Heritage Park to several beautiful waterfalls (allow three hours), or follow the Lavana Coastal Walk to explore the pristine beaches, swimming spots and coastal forest of the park (allow half a day). Getting up, up and away offers unique views of this Pacific paradise, served with a healthy dose of thrills for plenty of happy screams. The big picture doesn't get any bigger than seeing Fiji's islands dotted in the clear blue sea below, while freefalling at 200kph. Fiji's skydive companies offer tandem jumps (where you're strapped to the front of a professional skydiver) from up to 14,000 feet. Video packages, including the option of a skydiving photographer, let you relive the whole experience again and again. Many of the Fiji islands are home to parasailing operators. They harness you onto a parachute-like sail and tow you behind a speed boat while unwinding the cable so you get higher and higher. Some even offer double or triple seat harnesses, so you can share the experience and spectacular views with a friend before you're winched back down to the boat. You'll be surprised how high you can fly. Zooming above the forest canopy, through the trees and across river valleys is a fun way to experience inland areas of Fiji. Several zip line companies on Viti Levu offer exciting adventures that include multiple 'flights' connected by stopovers on treetop platforms. The stopovers come with spectacular views of the forest or across the ocean to nearby island groups. While many of the adventures mentioned above are perfect for families, here are some Fiji activities (beyond the fabulous kids clubs) for family groups with younger children. Located on the Coral Coast, this award-winning conservation-focused attraction offers close encounters with birds and reptiles, as well as easy walks through the forest. There's a fun splash pool for younger visitors, plus a roller coaster zip ride and jungle waterslide for grown-up kids. Get your family on track for big fun with the world's only electric-assisted, rail-mounted pushbike (velocipede) journey. Anyone can do it, because you can choose to pedal or motor as you ride the rails through forest, fields, villages and wetlands. This three-hour adventure includes an hour for swimming and refreshments at a beautiful deserted beach. Just a few kilometres from Nadi, this spectacular mountain valley was once the private garden of an orchid enthusiast. Today you can enjoy countless examples of these beautiful flowers as you wander the shady boardwalk and rainforest forest paths. Many of Fiji's resorts sponsor a local school or village and offer guests the chance to visit. You can often bring much-needed and appreciated supplies, such as books, stationery or clothes - check ahead with your accommodation if you're not sure about protocols. The visits provide a chance for young guests to broaden their horizons by connecting with happy local children who seem to have no concept of shyness. If the students sing for you, you're in for a treat. Glass bottom boats are a perfect way for young ones to explore the coral reefs and colourful fish in safety and comfort. If you have a child coming up to snorkelling age, this will get them hooked. For a special experience, check out Sea Fiji Reefs in Pacific Harbour - they operate a futuristic hydrofoil boat with a huge underwater viewing port.